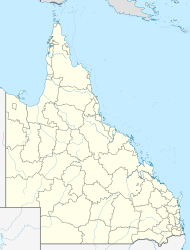 Gindie is a locality in the Central Highlands Region, Queensland, Australia. In the 2011 census, Gindie had a population of 382 people. The town of Fernlees is located in southern Gindie. The name Gindie means "much brigalow". Gindie Provisional School (also known as Gindie Siding Provisional School) opened 12 November 1897, becoming Gindie State School on 1 January 1909. The school closed in 1949 but later reopened. The Gindie State Farm was established In 1898 to experiment with growing new kinds of crops in the district such as sorghum, maize and pumpkins. The farm closed in 1932. Gindie State School is a government co-educational primary (P-7) school located on the Old Cullen-La-Ringo Road. In 2013, the school had an enrolment of 40 students in two classes, P-2 and 3-7, with 3 teachers (2 full-time equivalent). ^ a b Australian Bureau of Statistics (31 October 2012). "Gindie (SSC)". 2011 Census QuickStats. Retrieved 4 July 2014. ^ "Gindie (entry 46952)". Queensland Place Names. Queensland Government. Retrieved 4 July 2014. ^ "Fernlees - town in Central Highlands Region (entry 12307)". Queensland Place Names. Queensland Government. Retrieved 29 December 2017. ^ "Queensland Globe". State of Queensland. Retrieved 4 January 2018. ^ "SKETCHER". The Queenslander. 4 April 1914. p. 8. Retrieved 5 July 2014 – via National Library of Australia. ^ "Opening and closing dates of Queensland Schools". Queensland Government. Retrieved 4 July 2014. ^ "Agency ID5237, Gindie State School". Queensland State Archives. Retrieved 5 July 2014. ^ "Emerald Shire". Queensland Places. Centre for the Government of Queensland, University of Queensland. Retrieved 4 July 2014. ^ "2013 School Annual Report" (PDF). Gindie State School. Retrieved 5 July 2014. This page was last edited on 3 March 2018, at 16:58 (UTC).